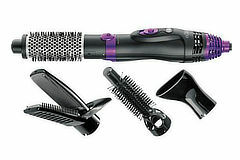 With the Nicky Clarke hot air styler create hair styles with volume, maximum control and minimum frizz. With two speed settings, two heat settings and turbo button, you can get more control, better results and more exciting looks than ever before. A cool shot function will also help you add the perfect finishing touch to any style. The prize draw closes on 27th May at 7.00pm.